Recently, Mexico has been in the news quite often because of its war on drugs or the “Mexican Civil War II”. For as long as anyone can remember there have been drugs present in Mexico; however, in our modern day, the drug industry has exploded. Due to the drug industry booming, there has been turmoil between various drug cartels leading to many deaths of innocent people. Many people, not only Mexican, have suffered from the violence of this drug war. Mexican drug cartels are all over the United States, which is negatively impacting our country because of their extreme violence and murderous acts. Many young American’s have become involved in the Mexican cartels and most of them voluntarily. One specific example on BBC news is about a young man, 20 year old Rosalio Reta of Texas, now in prison, became involved with the Mexican drug industry by the age of 13. “I thought it was cool. Got involved. That’s how everything started. There’s no way out once you get in.” comments Reta on why he became involved in this Mexican drug cartel. This is an excellent example of how the Mexican Drug War is negatively affecting the United States. They have come into the US and not only have they brought drugs in with them, they are giving more opportunity for our youth to become involved in drugs, crime, and even in the cartels themselves. In my opinion, the Mexican cartels all over the world have become similar to the way gangs act in the United States. They are not working together as an alliance, more so they are working against each other with the severe violence and hatred. This quote comes from an article in the New York Times, “Drug Wars: When a ‘Cartel’ Really Isn’t”. It enforces the reasoning behind my idea of referring to the drug cartels as gangs. 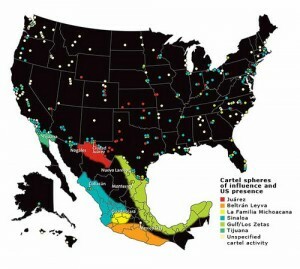 The cartels in the United States and in Mexico that are involved in the Mexican Drug war or the “Mexican Civil War II” would rather fight and work against each other, than work as cartels as they have done in the past. This change in working as a cartel is the main reason this has became a war on drugs which has spread all over the world. Mexican drug cartels are spreading, and have found a new location in West Africa. By having a location in West Africa, they have a greater connection to the European drug scene. One reason they would like to have involvement in Europe is because of the currency exchange rate. Drug cartels have caused an immense crisis in their new location and officials and military personnel are finding it hard to keep under control. As of now we only see the effects of the drug war spreading and becoming worse, we can only hope that things will soon become tranquil in Mexico for the well being of innocent citizens. I really liked how you compared the US gangs to the drug cartel in ference of how one another gets along with each other. Gangs and drus are very intertwined, the reality of it is really scary. What if anything, is West Africa doing about the cartel coming into their area?